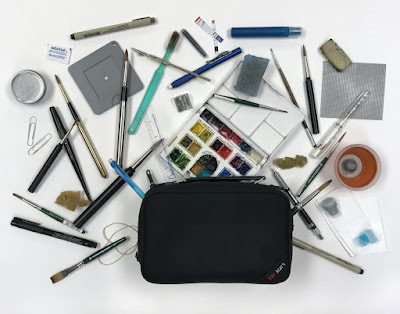 When we built our house, I had no idea that I would one day have a business requiring a large space for all my sewing equipment, including seven sewing machines and a 5' x 12' work table. I had planned to do my sewing in a little 10' x 12' room off the kitchen, and, for a year or so, that was perfectly adequate. I was happy in that bright, cheery space, but I quickly outgrew it and decided to set up shop in our basement. My old sewing room is now my art studio and also functions as a guest room, with a white wrought iron daybed providing seating during the day and sleeping space at night. For a couple of years now, I've had a line on my to-do list about making some pretty pillows for that daybed. 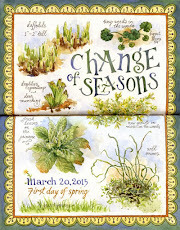 Well, I finally got around to it this past spring, and I thought you might enjoy seeing what I came up with. 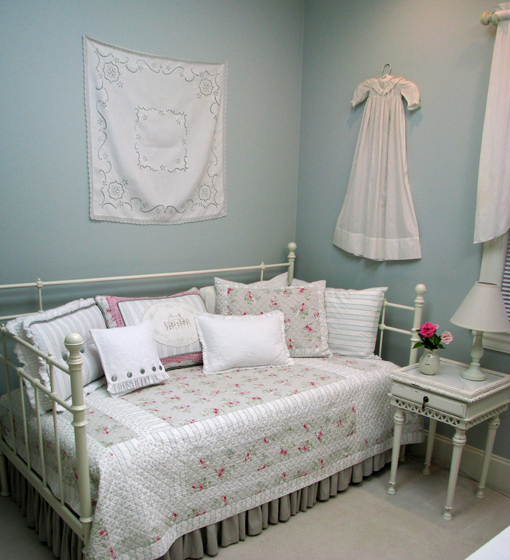 The shabby chic look has always appealed to me, with its soft, faded florals and worn, vintage look. It's so warm, homey, and comfortable looking - just the thing for a casual studio guest room. I found a quilt in Target's "Shabby Chic" line that I liked, then designed a grouping of pillows to coordinate with it, using vintage linens, cotton chenilles, floral fabrics, and a set of striped sheets. 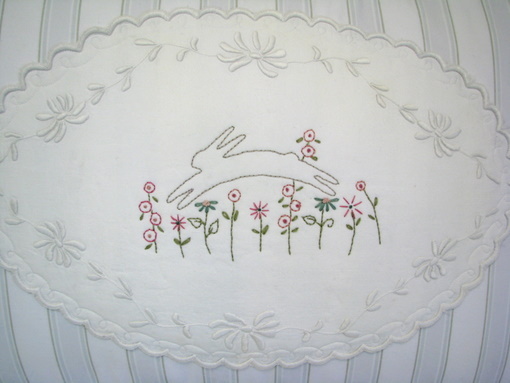 I hand embroidered a rabbit and flowers in the center of an antique doily, then layered it with striped fabric (a sheet set from the "Shabby Chic" line) and quilt batting. 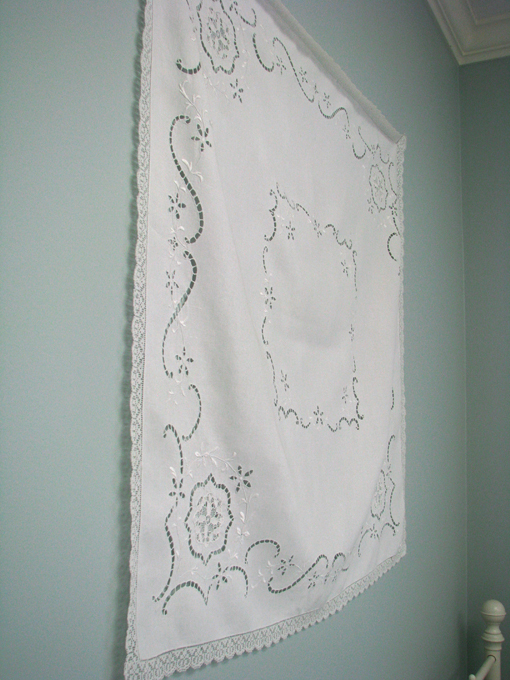 Finally, the doily was machine-quilted onto the background fabric. 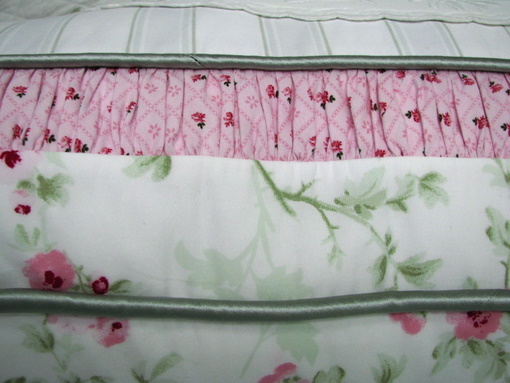 A shirred border of pink floral is set off by piping and surrounded by a pretty rose border. I had trouble finding fabric to coordinate with the bed quilt and ended up purchasing a pink and white floral shower curtain from Target that matched the quilt. The fabric was a little thin, so I interlined the pillow with white cotton flannel interlining. 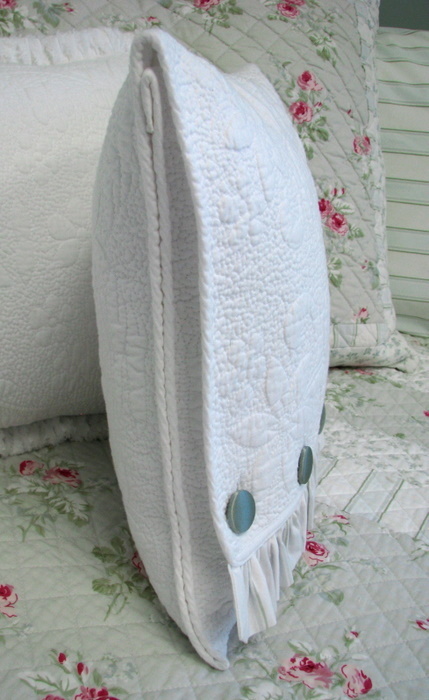 Two of the pillows are made of white quilted fabric, which is actually a table runner I found at TJ Maxx. I planned the pillows to maximize the use of the long narrow piece of fabric. 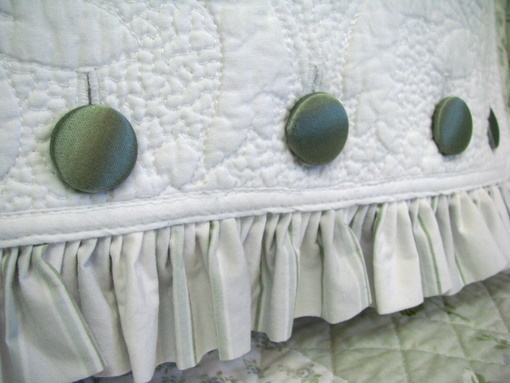 The flap of the envelope pillow is held down with covered buttons and finished off with a 1" ruffle. 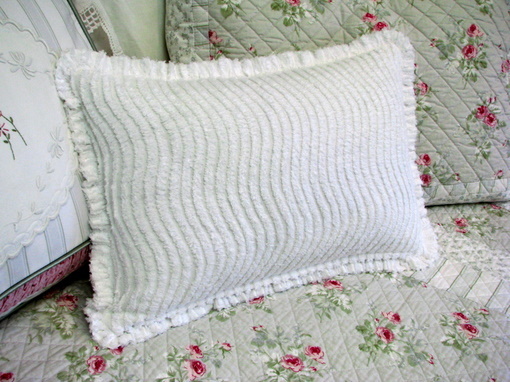 The lumbar pillow has the quilted fabric on the front side and a wavy chenille on the back, with a cute little chenille ruffle. This boxed pillow offers good back support for anyone sitting on the daybed, and I really like its tailored good looks. 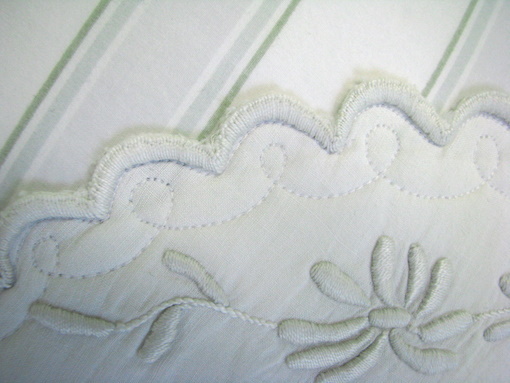 The striped face fabric is interlined and accented with aqua sateen piping. 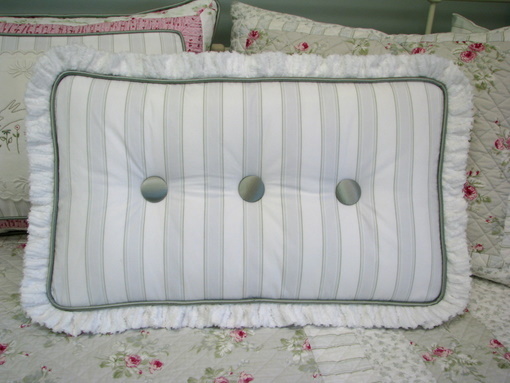 The pillow is tufted with covered buttons on both sides. 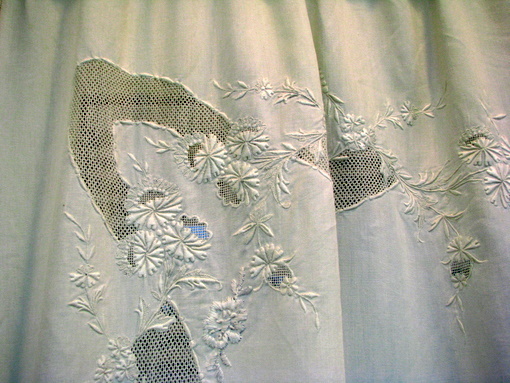 The boxing and ruffle are of white chenille. 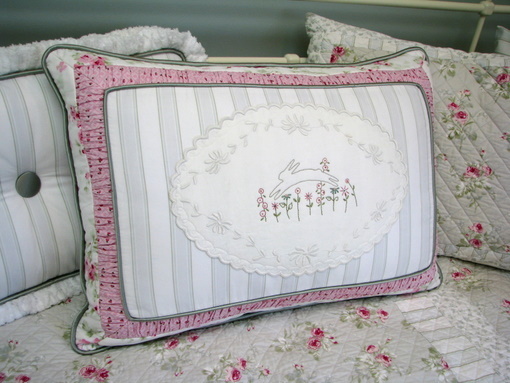 I love this last pillow, with it's ball fringe and vintage embroidery. I just finished it yesterday, and I'm not sure if I'll use it here in my studio or in the attic guest room. It matches the wall paint color in both rooms. 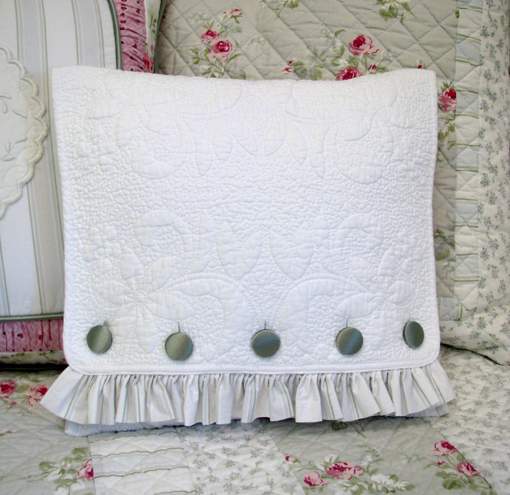 The center section of the pillow features sewn tucks on either side of a row of mother-of-pearl buttons. 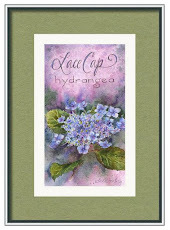 For the side sections, I used a set of white hand-embroidered antique pillowcases, top stitching close to the scalloped edge to anchor them to the aqua sateen background. 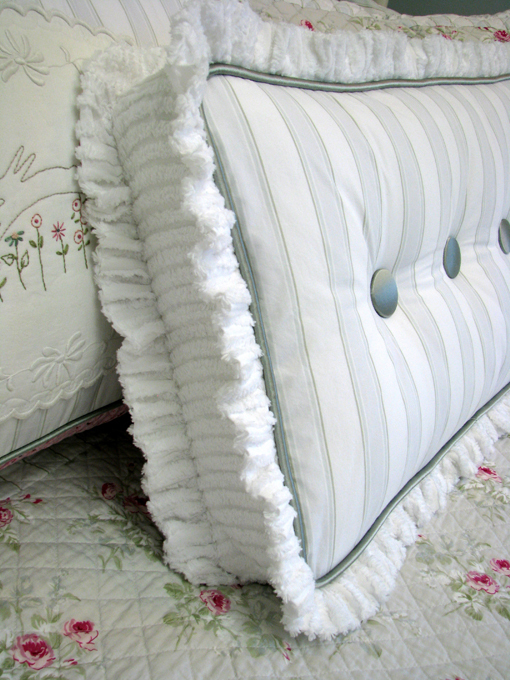 Cotton pom-pom fringe adds a whimsical note to this otherwise elegant pillow. 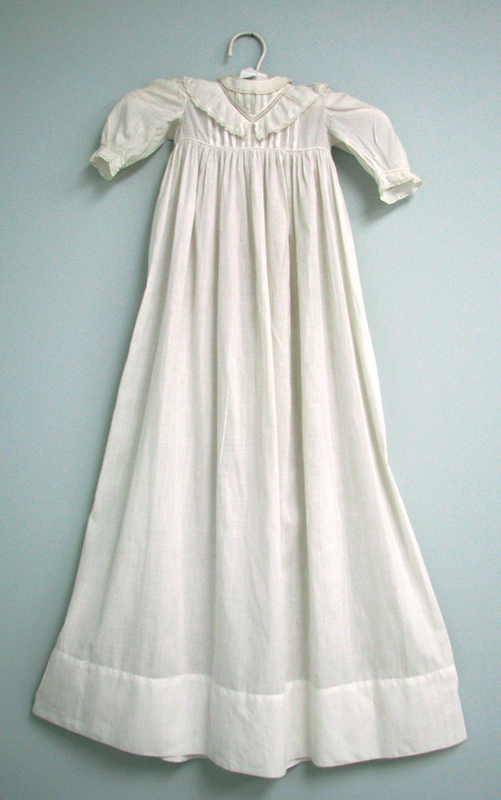 The reverse side is white ribbed cotton chenille. 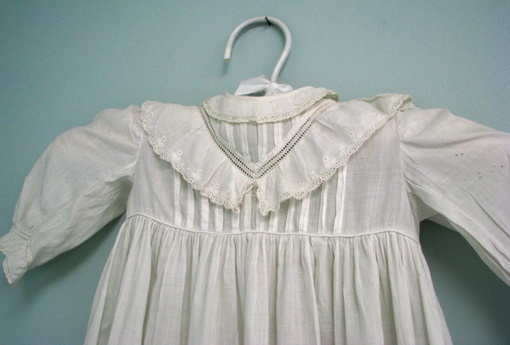 Rounding out the sleeping corner of my studio, I have an antique tablecloth hanging on the wall, along with a Victorian baby dress. I love vintage textiles for their level of detail and the beautiful dressmaking techniques that go into them. The valance in my studio is made from an antique sheet. 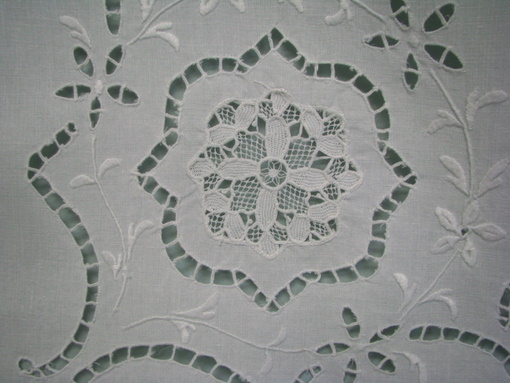 The lovely cutwork that originally decorated the top edge of the sheet now graces my window. 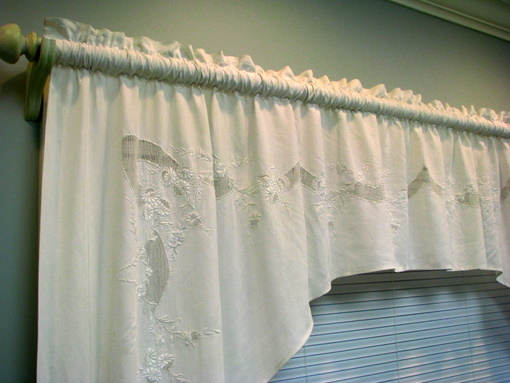 The pattern of the simple arched, gathered valance fits the curve of the embroidery perfectly. This little end table, a flea market find, has a glass top with anaglypta wallpaper underneath, which I really like. I want to one day make a cute lampshade for this plain white lamp - hmmm, maybe using vintage linens and pom-pom fringe? This vase was a birthday gift from my mom - isn't it cute? 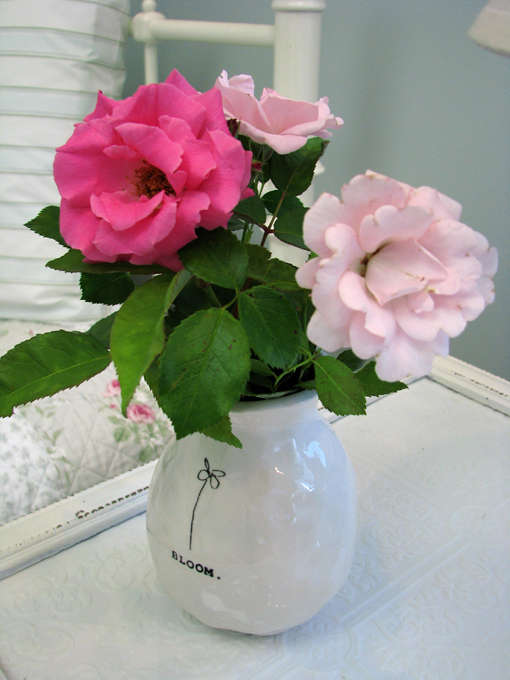 The roses from my garden look so pretty with the floral bedding. 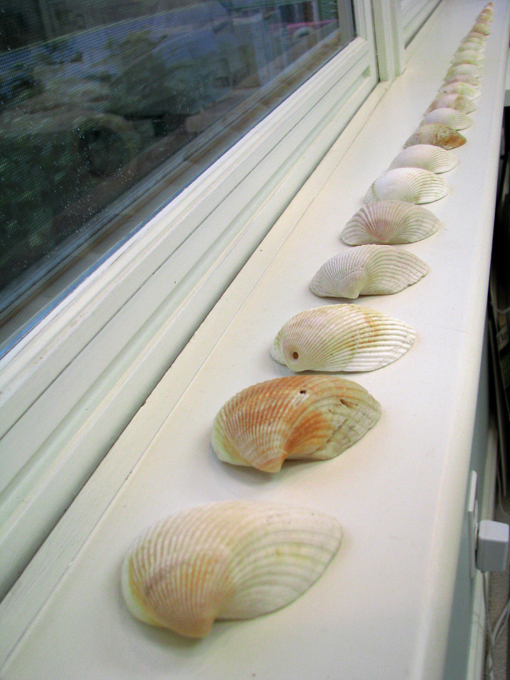 On the windowsill, I have lined up seashells collected during our summer vacations at Oak Island, NC. 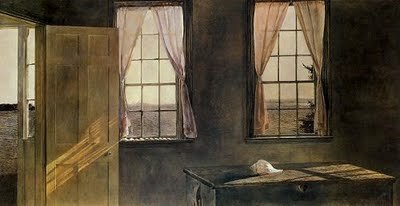 They remind me of the painting, "Her Room", by Andrew Wyeth, which I've always loved. See the shells lined up on the left window sill? I enjoyed fixing up this cozy corner of my studio - I like any excuse to make some fancy pillows! - and I hope my guests feel happy, peaceful, and welcome there. We had a fantastic time in Colorado last week! My sister, my niece, my mom, and I spent six wonderful days exploring the area around Colorado Springs and Woodland Park. This was a homecoming for me - I attended Colorado College, in Colorado Springs, from 1971-1975. The week was filled with lots of reminiscing about my days at CC and all of our wilderness backpacking adventures. It was great to be back in the mountains and to be able to share it with my favorite girlfriends. I thought you might enjoy seeing a few of the pictures I took while we were there. That's the back (western) side of Pike's Peak with fresh snow on it. Every time we drove down the road and saw this view, we felt as if we were looking at a postcard! The first day, we took a drive to Florissant Fossil Beds National Monument (we had to do some educational things, since my niece was along!) We stopped at the Hornbek Homestead, where an amazing pioneer woman, Adeline Hornbek, raised her 4 children and ran a successful ranch back in the 1800s. It's a neat story - what a strong, courageous woman! We visited the Colorado Wolf and Wildlife Center, an amazing wolf sanctuary and educational facility. The coolest part of the tour was when we got the wolves to howl - first one, then another, then all of them at once. It was so awesome! The next day, we visited Colorado Springs and the US Air Force Academy. Here's Palmer Hall, at Colorado College, where I spent many an afternoon daydreaming and looking out the windows at that beautiful blue Colorado sky. When I was in college, I backpacked to the top of Pike's Peak carrying a 30-pound pack (twice!) - this time I wimped out and rode the cog railway to the top. The view from the top, looking out over Colorado Springs and the eastern plains, is spectacular. When we visited Mueller State Park, it was a perfect Colorado day with that deep, deep blue sky, puffy white clouds, and just enough breeze to keep you comfortable. 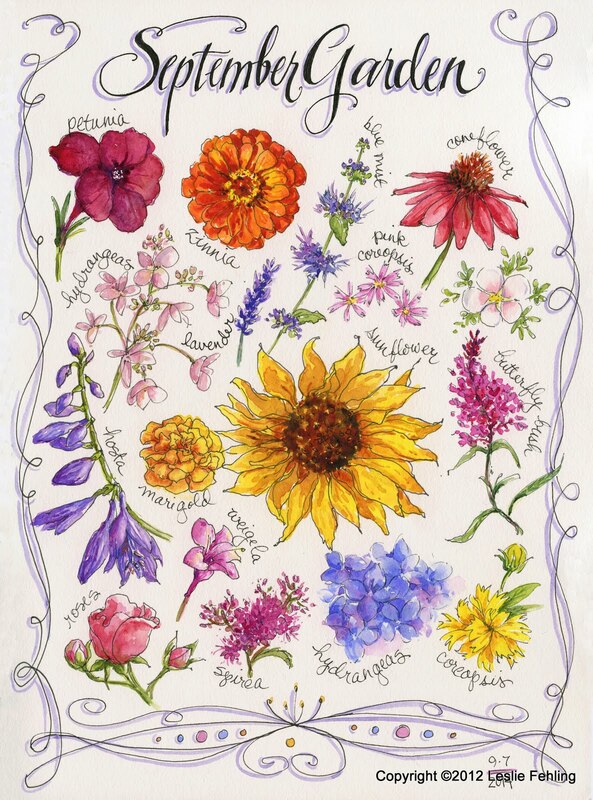 Hiking along through the woods, listening to the birds and discovering wildflowers along the way, smelling the summery fragrance of ponderosa pines baking in the sunshine, I felt so absolutely content and happy. What a blessing, to be able to spend time in such a beautiful place! My mom and I remembered camping along the South Platte River, near Lake George, CO, years ago when my family came to pick me up from college one summer. We were so excited to find the same canyon where we had camped 40 years ago. Nothing had changed about it - that's reassuring. These gorgeous Rocky Mountain iris were blooming along the South Platte River. If you've never visited the Rockies, I hope you'll have a chance to one of these days. There are beautiful sights around every corner, and I can practically guarantee you'll be on a Rocky Mountain High! I'll be back in a few days to show you the sketches I did while I was away. They just need a few finishing touches. 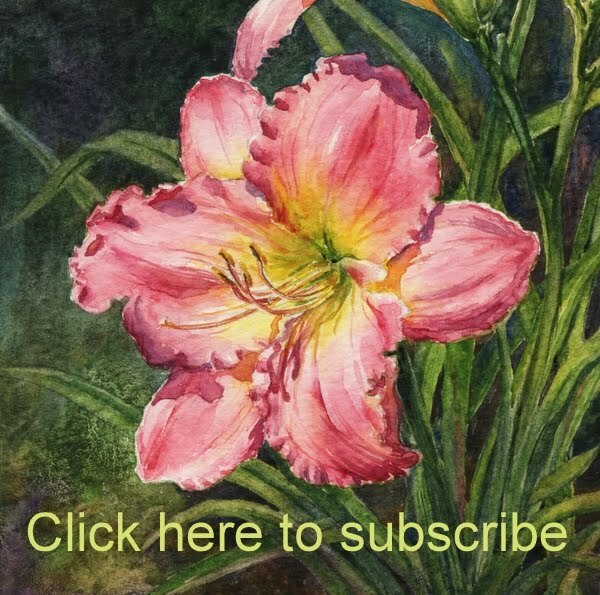 Step-by-Step Watercolor Painting: "May Morning"